Much of the media in this genre is created in the United States, which is hardly surprising given the hegemony of American pop culture. Because of the pervasiveness of American pop culture it has come to constitute a form of American soft power. No country ever wants to see itself as anything but the center of the world but American pop culture has exceedingly made a point of this not only in the fantasy genre but in pretty much everything it produces. In the eighties, it was all about some brave American taking on a Russian threat and ending up victorious; the hero often wrapped in the stars and stripes, delivering a big dose of patriotism with their knock out punch. In the nineties, with the end of the cold war, we saw a brief time of antagonists coming from different geographic areas but the hero resoundingly remained American. With the dawn of the 21st century and the rise of the McWorld vs Jihad dilemma, antagonists have overwhelmingly been Middle Eastern, while the hero remained American. The point of all of these stories is to suggest to the reader, viewer and consumer that no matter the situation or the villain, America is always on the side of right and will emerge victorious based solely American exceptionalism. The bigger the threat, the faster and stronger the American response will be and whether by might or intelligence, some American will have the right answer to the situation. The very first time I became aware of this phenomenon in speculative fiction was the movie Independence Day. Yeah, it was great to watch Will Smith, as Captain Steven Hiller, take on the aliens but it’s telling that it was Jeff Goldblum, as David Levinson, who came up with the solution to the alien invasion. Yes, Levinson graduated from MIT and was an environmentalist but am I really supposed to believe that there was no one else outside of an American smart enough to figure out the invasion countdown clock? And what about the fact that the rest of the world seemed to be sitting around waiting for someone else to come up with a solution? Not only did Hiller and Levinson take the war to the aliens on behalf of the rest of the world, the Americans co-ordinated the attack which occurred on July 4th. 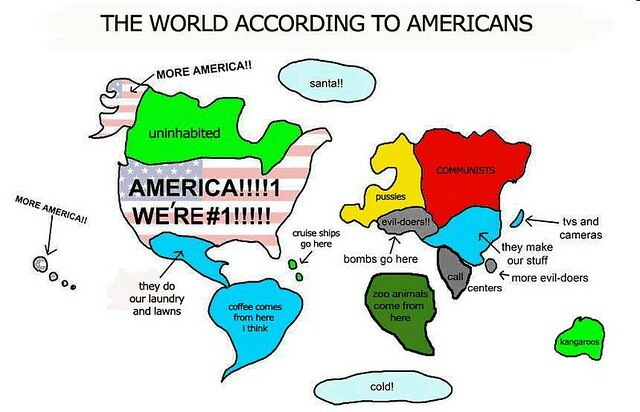 Could American exceptionalism be any more obvious? Even President Thomas J. Whitmore, played by Bill Pullman, joined the fight because he was a former Vietnam vet. If that were not enough, Whitmore declared July 4th the Independence Day for the world. It's not like the independence of any other country from colonial rule could possibly be significant. “Perhaps it’s fate that today is the 4th of July, and you will once again be fighting for our freedom, not from tyranny, oppression, or persecution -- but from annihilation. Considering that the Americans would not have gotten to their Independence Day without the French, one really had to suspend belief to buy into the whole rally the troops moment delivered by the impassioned Pullman, as President Whitmore. Naturally, the president had to get into the action because like the rest of his people, he was a problem solver and epically brave. Thank goodness this is fiction because despite having the title commander in chief, there has only been one president since Eisenhower to actually serve in an active duty position. When I read World War Z: An Oral History of the Zombie War by Max Brooks, one of the things that impressed me was the global nature of the story itself which is quite unlike many of the zombie apocalypse stories currently airing (think The Walking Dead or I Zombie for instance). Not only did the novel cover many different areas, each country dealt with the zombie invasion based on their culture. North Korea for instance, simply moved its people below ground and cut itself off from the rest world. When this story however became the film World War Z , the international narrative completely changed. I suppose the producers thought that with Brad Pitt taking on the role of Gerry Lane in a story that didn't originally have a protagonist, we wouldn’t notice the change in focus. Instead of the story reflecting how different countries and cultures dealt with a zombie apocalypse, we were offered one globe trotting American saving the world, with the rest of humanity serving in an ancillary position. Naturally, Gerry is excellent at his job and comes up with the solution. The world was saved by the handsome Brad Pitt in 116 minutes, so who cares about the original narrative, or the fact that the change served the agenda of promoting America as the saviour of the world? Continuing on with American exceptionalism being expressed through military might in a dystopia, we have The Last Ship. A plague is killing off the human population but thankfully, the American government acted quickly at the first sign of mass contagion, and sent out the U.S.S. Nathan James to find a primordial strain. It’s funny how in fiction, the U.S. government can act quickly because when presented with the first deaths from HIV/AIDS, the government was quick to turn its back. I suppose the difference is that in The Last Ship, the government actually feels the people who are dying are actually human and that the contagion is not an act of an angry God dealing out justice to sinners. The Last Ship gave us some nostalgia in the first season because the Navy quickly found itself facing off against the Russians. I’m sure that this is no accident given the current furor over Putin. Naturally, the bright CO CDR Tom Chandler is able to outsmart and defeat Admiral Konstantin Nikolajewitsch Ruskov. Americans supposedly won the Cold War all on their lonesome, so how could they possibly then be defeated by the supposedly evil Russians in a dystopian? With the Russians defeated, the next antagonists were the British. There may have been a time when the sun didn’t set on the British empire but as far as the crew of Nathan James is concerned, the British are not going to set the agenda for the new world. And besides, everyone knows that the British are just evil, listen to those accents! Unlike the British and the Russians, the seamen of the Nathan James only have the good of humanity in their hearts and are absolutely incorruptible. They even manage to rescue the president and prop him up for good measure. Yeah for the American way of life and their much vaunted democracy, that is unless you are a person of colour and are trying to vote, or your daddy has enough money to buy an election. The American leader saving the world with his godlike awesomeness is almost parodied with Falling Skies. Despite the lack of technology which would very much make the story reasonably narrow, repeatedly we see Tom setting up to save the world. By the last season the show almost become a comedy with Tom setting up “Mason Militias” across the world. The world. The entire global resistance against the aliens (which for several seasons we never even knew about to a degree that made me think Cochise just made it up and was flat out trolling the Masons) was inspired by and led by Tom to a degree where I would not have even blinked had Tom been named the second coming. Yet, even this was not enough, because in the end, the threat was defeated by Tom single handed - all those worshipful militias were utterly pointless and added nothing to the actual victory. The entire world wide resistance became a cheer leading squad for the great American hero. Even Falling Skies pales next to Sleepy Hollow and here we have reached the very edge of parody. Not only do we have Americans saving the world - but they will do it with the help of their amazing supernaturally knowledgeable Founding Fathers, who will be Name Dropped in every single episode.The American Revolutionary War has changed from a local independence war to a war against good and evil where righteous knowledgeable Founding Fathers and Heroes used their holy brilliance to resist their demonic, world-ending attacks. Demons from all over the world, from every culture imaginable, flocked to the nascent United States only to be stopped by the omni-present heroic Betsy Ross, Paul Revere and All-Father Washington. Possibly riding Bald Eagles into battle and wearing clothing entirely sewn from American flags. In season 4, I fully expect a red coated demon wielding the Communist Manifesto to be banished by Ichabod expertly singing the Star Spangled Banner (no mean feat given how hard that song is to sing) while Abbie ineffectually shoots at it (again). Another show that has done a good job of subverting this to some degree is Doctor Who. While the Doctor, an alien, is of course the one who saves the day most of the time (because he’s brilliant), and the show is certainly overwhelmingly British-centric, there is an interesting comment on how the world reacts to the various crises they face: specifically with UNIT. A global accountability is quietly worked into the cannon of Who - when the Slaveen co-opted Downing Street, it was to the UN they had to appeal for access to Britain’s own nuclear weapons. When the Master assumed the role of Prime Minister, he faced fierce criticism for his acting unilaterally without UN consent. On repeated occasions when a problem has arisen, we see Unit being called to help - from the Sontaran invasion to buses randomly falling through portals. And when we do see Britain acting unilaterally, it often ends poorly - from Harriet Jones using Torchwood to destroy an invading space ship, to Torchwood’s disastrous enabling a cybermen invasion. It isn’t constant and the show remains Britain focused but the sense of global effort, accountability and unity is there. It is not Britain saves the world. A trope of any powerful nation constantly making global decisions and saving the world would be eye rollingly irritating and arrogant - but this trope is especially destructive and worrisome when presenting a western nation doing so in the modern political context (or most historical contexts, for that matter). Saving other nations, saving the world, is often (usually dishonestly) invoked to justify violent intervention across the world. The idea that the west, and America specifically, can not only unilaterally “save” the world one bomb at a time - but indeed should - is already deeply ingrained and doesn’t need any further encouragement or support. A more nuanced, a more detailed and less simplistic way of addressing global problems is desperately needed - one that doesn’t emphasise unilateral action and the world needing an American saviour.